More than 20,000 have escaped from IDP camps? Who will be the new Foreign Secretary? According to Prison sources, SSP Vaas Gunawardena’s wife , Shyamalie Priyadharshini Perera , one of the main suspects in the assault, abduction and illegal detention of IT student Nipuna Ramanayake who was remanded until 31 st August is receiving super exclusive comforts at the Welikada Prison.. From the moment she was remanded on 20th August she had been enjoying all the comforts and conveniences . These facilities are being provided most secretly and this room had been allotted to exclusive women prisoners only. It has a fan and a bed and other conveniences that could be expected in a home. It is a Prison Hospital ward for women which has been transformed to give all these comforts. A politico’s wife who was awarded a death penalty too used this comfort laden room until she received the Presidential pardon, it has come to light through prison officials. It has also transpired ,a woman prison Officer is responsible for providing all these comforts to the SSP’s wife , and she is the Officer who greeted the SSP’s wife when she stepped into the prison. 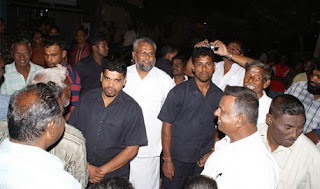 The counsel appearing for the family of the deceased in the case of the two Tamil girls found in Bauddhaloka Mw, Jeewani and Sumanthi today moved in court to exhume the bodies of the two Tamil girls and hold a fresh autopsy as they were not satisfied with the one done earlier by the JMO. The Magistrate had instructed the counsel to plead by way of an affidavit sworn by Move to exhume Bauddhaloka victimsthe parents on the next date of the case. The parents allege that external injuries were observed, although the JMO had stated that the death of the two girls was a result of drowning. Irrigation Minister Jayatissa Ranaweera told Parliament yesterday that Surveys and geological investigations are being done for design and construction activities of the Uma Oya project. This mega irrigation scheme estimated at US$ 590 million is scheduled to be completed by 2014. The Government ceremonially launched the construction work of this project on April 28, 2008 he said. Of the total estimated cost of the project, US$ 450 million will be obtained from Export Development Bank of Iran (EDBI) as a loan while the balance US$ 140 million will be granted by the Sri Lankan Government. The Minister was responding to an oral question raised by the JVP MP K.V. Samantha Vidyaratne. Asked on the amount of money that has been obtained upto now, Minister Ranaweera said an agreement has been signed with Iran Government to obtain US$450 million. In addition, Rs. 7060 million has been allocated by the Treasury for this project. The Uma Oya project consists of 45m high dam at Puhulpola on Uma Oya and the reservoir 30m high dam at Dyraba on Matotilla Oya and the reservoir, 3.8 km long link tunnel connecting Puhulpola and Dyraba reservoirs, 15.2 km long pressure tunnel from Dyraba to power station, underground Hydro-power station with 120mw installed capacity and 3.4 km long outlet tunnel from power station on Alikota-ara. Meanwhile, the project has also planned to set up a power Transmission line from power station to grid sub station at Badulla and construct a 5 km long alternative road to replace the stretch of Welimada - Badulla road which will go under water due to creation of the Puhulpola reservoir," the Minister added. The examinations department has ordered the removal of examinations staff at an Advanced Level examination centre in Kotikawatte after they had mistakenly distributed papers for students this morning for an exam which was scheduled to be held this evening, a private radio station reported. According to the report the staff had mistakenly opened the packet containing the exam papers in the morning and distributed it to the students when that particular exam was scheduled to be held this evening. The Examinations department said that the staff at the particular centre will be removed on Monday. The government admitted in Parliament today that it conducted the inaugural ceremony for the Uma Oya Project at a cost of Rs. 26 million even before the feasibility study was conducted. Irrigation Minister Jayatissa Ranaweera revealed this in Parliament in response to a question by JVP MP Samantha Vidyaratne. Of this expenditure, Rs. 8.5 million had been spent for advertisement and media, Rs. 2.9 million for refreshment, Rs. 1.6 million for cultural clams. SSP Vaas Gunawardena against whom there are charges over the abduction, assault and illegal detention of Nipuna Ramanayake of the SLIIT Campus has been transferred to the Police Headquarters with effect from 14th August. This is a step taken by the IGP while investigations are being conducted against the SSP. Already, two Sub Inspectors have been transferred to Negombo and Kegalle; and four constables transferred to Galle, Kandy, Avisawella and Thebuwana in this connection. Investigations are also being conducted against them in the meanwhile. However, it is significant to note that no arrests have been made so far although 12 days have already elapsed. More than 20,000 Internally Displaced Persons (IDPs) residing in camps in Vavuniya have gone missing, and a census into the disappearances is now nearing completion. According to him, it’s unclear how so many people had made their getaway as there had been a steady decline in numbers, and nothing concrete to investigate on. Unofficial sources claimed that some Tiger top leaders who had also been hiding among civilians in the camps have made their getaway, and have reportedly bribed officials with sums running to millions of rupees. The source added that most of the IDPs have occasionally left camps saying they required treatment from hospitals, especially during some epidemics. Most of them, however, have not returned when they were expected to do so. The senior official said the number of visits to hospitals has been drastically reduced and humanitarian workers are required to see that the needs of IDPs such as medicines are met. The bodies of two tamil servant girls were found yesterday in a canal opposite the houses where they worked in Cinnamon Gardens. The servant girls were discovered missing in the early hours of yesterday and their bodies were found floating in the canal by neighbours. The girls had written a note together in Tamil saying: “Because of a reason that causes us unbearable pain we are taking our lives. No one is to blame,” a Police source said. The servant girls were aged 16 and 18 and were from Maskeliya. A police officer said they were yet to ascertain the motive for the possible suicide and inquiries are underway. Police spokesperson SSP Ranjith Gunesekera said that the girls were Tamil. Suicide was possible and however the cause of the death can be established at the inquest. Foreign Secretary Dr Palitha Kohona will leave for New York early next month to take up his new post as Sri Lanka’s Permanent Representative to the United Nations, informed sources said. At the time of going to press it was not clear as to who will replace him as Foreign Secretary. The official government website also announced on Friday that Dr. Kohona, will shortly assume duties as the Permanent Representative of Sri Lanka to the United Nations, New York. The incumbent Sri Lankan Permanent Representative in New York H.MG.S. Palihakkara was scheduled to return to Colombo over the weekend for personal reasons prior to completing his term there. It is also still not clear who will fill the vacancy in Geneva as the Country’s Permanent Representative to the UN there. Dr Dayan Jayatillake was recently recalled without any official explanation. It was only in March this year that Jayatillake was given a one year extension. It is believed that Jayatilleka’s sudden recall is over his getting entangled in public debates over some sensitive domestic issues. Meanwhile, Jayatilleka yesterday denied rumours that he is to be the next Ambassador to Cuba. He added that the Government of Sri Lanka has not contacted him after informing that his tenure in Geneva will end on August 20. “I have not been appointed, nor approached, nor has this been mentioned to me at all by anyone in the Government. I think this is merely a rumour without foundation,” Jayatilleka said. “I have had no communication from GOSL following the fax conveying my dismissal,” he added. Earlier this week media reports circulated stating that Jayatilleka would be appointed as Sri Lanka’s ambassador in Cuba replacing Ms Tamara Kunanayakam. Last month Jayatilleka’s tenure as Sri Lanka’s Permanent Representative of Sri Lanka to the United Nations came to an abrupt end as he was informed that his term in Geneva will end on August 20. Meanwhile, senior diplomat Ms. Kshenuka Seneviratne is now tipped to assume duties as Sri Lanka’s ambassador to Rome. The current ambassador there attorney at law Hemantha Warnakulasuriya is expected to complete his term shortly.